Last years winners Naas remain unbeaten in this years competition after a comfortable win over Sarsfields. 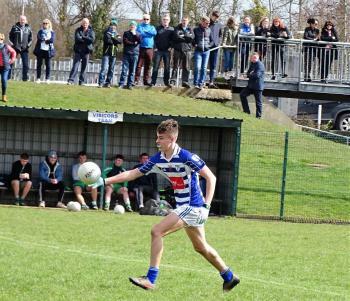 Although Sarsfields opened the scoring Naas dominated the first quarter and led 2 – 4 to 0 – 2 after fifteen minutes. The Naas goals coming from Jack Carroll and Tom Browne. A second Browne goal and one from full –forward Eoin Maguire Naas led 4 – 7 to 0 – 5 at the interval. The Naas points came from Tom Browne(4) and one point each from Colm Joyce, Eoin Maguire and Ger Griffin. Naas started the second half with three Colm Joyce points.Four from Ger Griffin and a goal and a point from Jack Carroll completed the Naas scoring. Sarsfields replied with five points.